This October, various charity organisations and NGOs across South Africa are set to benefit from the local roll-out of the annual RE Cares Month. This global community outreach programme is spearheaded by leading content and technology solutions provider, LexisNexis South Africa, through its international parent company, the RELX Group. RE Cares supports employee and corporate engagement that makes a positive impact on society through volunteerism and giving. In South Africa the campaign is held during the first week of October to coincide with National Human Trafficking Awareness Week. Anti-human trafficking initiatives are a core focus of LexisNexis’ corporate social responsibility programmes and the company works with partners towards combatting this scourge by offering direct financial support, promoting awareness, sponsoring victim support and assisting with training and education initiatives. Each year LexisNexis gives its employees two days off to volunteer for charitable organisations. This encompasses business-sponsored volunteer activities and charitable fundraising events, in-kind charitable donations and RE Cares activities. The South African leg of the RE Cares Month programme commenced in Bloemfontein on Thursday, 4 October. Staff from one of the smallest LexisNexis branches partnered with the Reach for a Dream Foundation and hosted an arts and crafts day for youngsters fighting life-threatening illnesses. 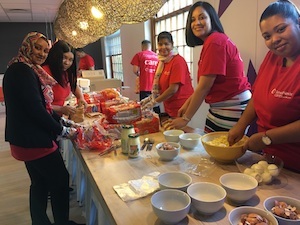 On Friday, 5 October volunteers from the LexisNexis team in Cape Town harnessed the company’s technological expertise and participated in a Cares Day Hackathon with the aim of building a mobile-friendly web application to help find missing children. With a child going missing every five hours in South Africa, the key to finding them and getting them back home is to get their faces into the public eye as quickly as possible. More than 50 of LexisNexis’ brightest minds in technological development put their heads and hands together and have begun work on an innovative app to help communities such as Lavender Hill to have a hub that houses information around missing children. The basic purpose of the app is to enable such information to be made available to the public as soon as possible after the child’s disappearance. The Cape Town team also joined hands with a number of NGOs including Learning in Reach, Dress for Success Cape Town and Philisa Abafazi Bethu, to equip 50 young mothers from Lavender Hill with basic CVs and job-hunting tips as well as educate them on how to protect their children. In Johannesburg the LexisNexis team hosted trafficking survivor and author of Exit!, Grizelda Grootboom, on Thursday, 11 October to educate staff about the scourge of human trafficking in South Africa. The team also spent a few hours putting together care packs of much-needed hygiene items for long-time NGO partner, Mercy House. On 15 October 12 of LexisNexis South Africa’s senior managers will take to the mountain bike trails in the name of charity. They will undertake the gruelling Berg and Bush Cycle Challenge in KwaZulu-Natal, with the aim of raising funds for LexisNexis’ NGO partners this Cares Month. Staff in Port Elizabeth will team up with relief organisation Love Story on Wednesday, 24 October to feed more than 200 homeless men, women and children. In Durban, staff from LexisNexis’ head office in Morningside will engage in a mix of activities in the office and off site with beneficiaries. Between 23 to 25 October volunteers will feed homeless and vulnerable individuals at the Denis Hurley Centre. On 26 October employees will donate loaves of bread to reach a target of 600 sandwiches that will be provided to various beneficiaries. They will also help to spruce up the premises of the St. Thomas’ Children’s Home which caters for 2- to 6-year-old kids and will volunteer at the Bhambayi Project, helping to clean and feeding and playing educational games with the children. In East London LexisNexis employees will be handing over a cash donation to a charity of their choice. Last said LexisNexis and its employees care deeply about adhering to the highest standards of behaviour and working collaboratively to improve the lives of others in its surrounding communities. He said the company was dedicated to playing a positive role in local and global communities, primarily through employee involvement and would also continue to work with others in its industry to unlock the social, political and economic potential that exists in societies around the globe. Globally LexisNexis works to uphold the rule of law by providing regulatory content in print, digital and training formats for professionals and academics in the fields of law, tax, accounting and government. Its business and corporate social responsibility efforts are guided by the company’s common global purpose of upholding the rule of law.